Even the best power plant team can run into problems that they cannot fix alone. That’s when a trusted partner like Mechanical Dynamics and Analysis (MD&A) is critical to get an asset back into service quickly. Take the generating unit whose valve stand suffered an exceptionally deep crack in its inner bore caused by an improperly installed bushing. MD&A received the valve stand at its St. Louis repair facility not knowing just how extensive the crack was. Working with the utility customer, a repair program was designed that included excavating the crack, weld-repairing the stand, and installing new bushings. The repair was completed in three weeks and saved the utility from buying an entirely new valve stand. At MD&A’s repair facility, a full set of readings were taken on the valve stand. Inspection revealed heavy galling on the bushing fit ODs, and measurements were taken to determine if there was enough stock for the proper interference fits. 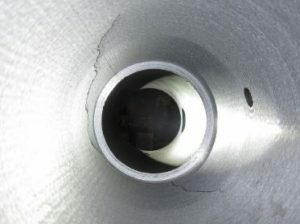 NDE inspection revealed a crack extending some 14” into the valve stand bore. It began on one side of the bore, moved toward the valve’s outboard side, wrapped around the bore, and came back toward the inner bore. 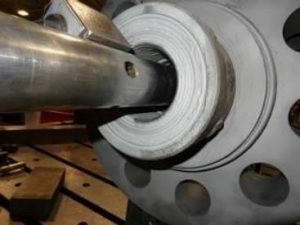 The repair plan included machining the bushing bore to determine how deep the crack was, and removing an OEM modification that held the inner bushing fits. 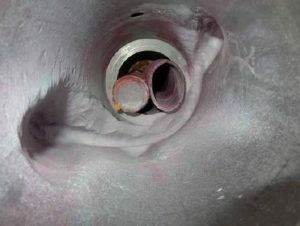 After removing ¾” on a side from the bore, MD&A determined that the crack persisted under the stud flange, so the repair was modified to hand grind the crack. 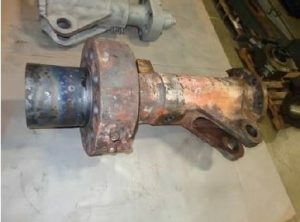 With the crack removed, the valve stand was pre-heated and MD&A technicians hand-welded deep pockets that were present on the valve stand to return those areas to the proper bore diameter. Once the hand-ground area was welded and hand-worked, a second NDE was done to ensure no new cracks had formed. Seven layers of weld were added to the valve stand using an automated welder. After completing the post weld heat treatment (PWHT), the stand was set up in a horizontal boring mill for rough machining to within .030” final size. A final NDE was done to ensure no further cracking had occurred, and then the bore was machined to final size. All bushings were machined, installed and the valve underwent a try bar check. As a final step, the valve was set between centers, and the casing fit OD and gasket face were cut to design size. For this critical valve stand repair, MD&A tapped its deep and experienced team of experts to complete the repair in a time frame that quickly returned the unit to full service versus replacing the valve stand which would have taken months. Have MD&A inspect or repair your valves today, call our Turbine-Generator Repair Facility at (314) 880-3000 or use our Contact form.